A key role of the board is overseeing M&A. 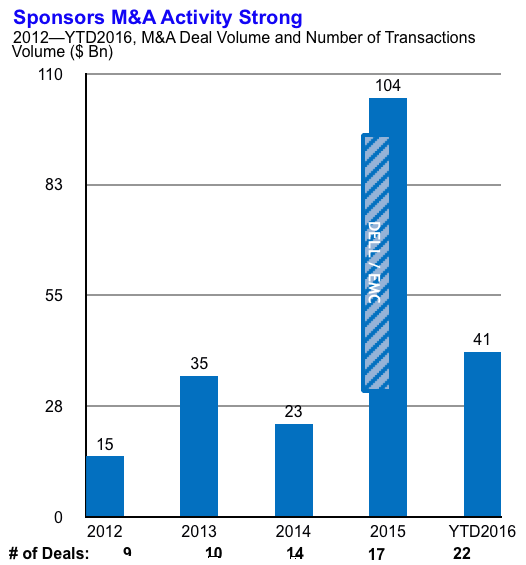 Technology M&A is having another record year and not showing any signs of slowing down. This year alone there have been 46 deals that were over $ 1 billion in value. While we’ve seen boom years in Technology M&A before, something is different this time around. 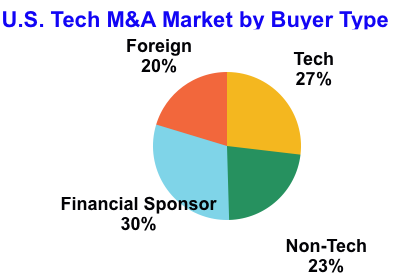 Importantly, of the 27% of transactions where the buyer was ultimately a U.S. based technology company, a significant percentage had participation from foreign, non-technology or financial sponsor buyers in the process who bid but didn’t win. There is no doubt that the participation of these “nontraditional” buyers enhances the competitive tension of the process. So why does this shift dramatically impact your Boards? We all know board directors are subject to the duties of care. The issues a director will face during certain sale or merger transactions are subject to additional so-called Revlon duties to ensure that reasonable efforts are made to secure the highest price available. The carrying out of these duties is subject to intense scrutiny. It is a virtual certainty that an M&A transaction of a publicly-listed company in the U.S. will ultimately lead to litigation focused on how the board conducted the process. So how do directors ensure they are getting the highest price available? Five years ago when the majority of deals were “tech to tech”, “domestic to domestic”, “strategic to strategic”, there were probably 6-8 great full-scale/full-reach advisors along with 8-10 great boutiques to consider for selling your company. Today, unless you are certain that your company doesn’t appeal to the cross-industry or international or financial sponsor buyer, your smart choices are going to be fewer if you want to reach that broad buyer group and get the highest price consistent with your fiduciary duty. 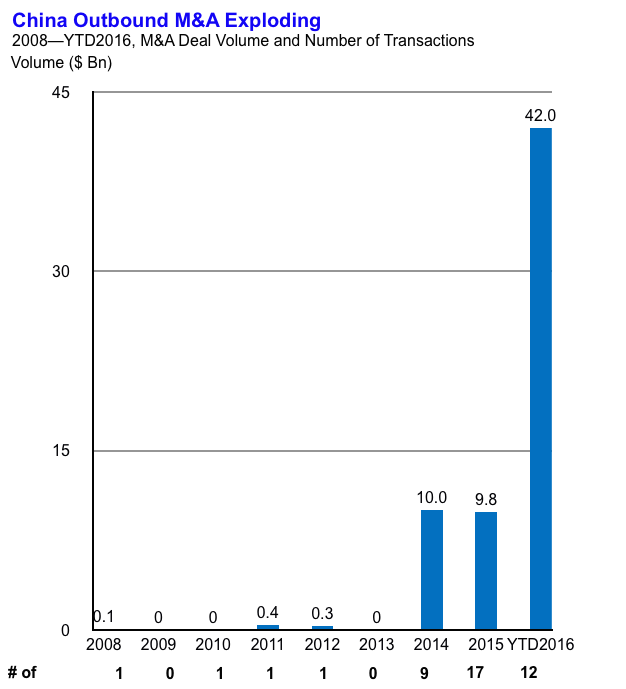 $ 28 billion China announced outbound M&A transactions (see chart below), including Ingram Micro’s $ 6 billion sale to HNA Group’s Tianjin Tianhai, which was the largest outbound acquisition by a Chinese company in the technology sector so far. Additionally, tax inversions where targeted U.S. companies are re-domiciled abroad have been increasingly common transaction structures attracting foreign buyers. Applied Materials’ $ 9 billion merger with Tokyo-Electron (which was later terminated due to anti-trust concerns) was motivated in part by both companies’ desire to lower corporate income taxes on future earnings through an inversion structure. The implication for the board of these transactions is clear: an effective financial advisor must have a global network with knowledge and access to potential buyers who will emerge from other geographies. That gives you a number of great choices but they need to be from among the global firms that have bankers around the globe with access to and knowledge of these interested foreign buyers. Increasingly buyers outside of your company’s industry have emerged as competitive acquirors. In 2015 alone, there were $ 28.4 billion cross-industry technology acquisitions, vs. $ 10.8 billion in 2012. This is an amazing 263% increase in cross-industry buyer activity. Often it depends on your company’s specific cross-industry appeal. A common theme has been cash-rich, mature buyers seeking new growth platforms to build on. Information technology provides lots of examples of nontraditional companies acquiring companies in technology such as Monsanto’s purchase of The Climate Corporation, Verizon’s purchase of AOL and more recently Yahoo, and Walmart’s acquisition of Jet. For these acquisitions to succeed, the financial advisor needs the ability to advise the board to include these cross-industry buyers in the sale process. Importantly, they need the relationships and knowledge to cultivate these new buyers who fall outside of tech. With 15 or so industries to cover, this leads us back to the larger firms that have access to the top buyers across industries, not just tech. To properly gauge the interest of financial sponsors and to advise the board if and when you should invite financial sponsors into a sale process, your financial advisor needs to have close relationships with the relevant financial sponsors. Most importantly, have the knowledge to assess their financial capacity to compete against strategic buyers and know the maximum amounts they can aggressively pay. A key component of credibility for Directors in determining the sponsors’ wherewithal comes from the financial advisor’s leverage lending expertise (both in the bank and bond markets) which are relied on to fund sponsor M&A transactions. Without real-time knowledge of the leveraged finance markets, your financial advisory will not be able to credibly determine the cost of financing that the sponsor relies on, and as a consequence, will not have the insights necessary to determine what price a financial sponsor could ultimately be able to pay. Several months ago, you would think ok, financial sponsors wouldn’t pay 6.5x revenues and 69% premium for Cvent or 5.9x revenues and a 64% premium for Marketo which Vista Equity Partners did earlier this year. Most recently Infoblox was sold to a private equity firm at the highest premium ever paid by a financial sponsor for a technology company (73%). Having in depth knowledge of this market and the sponsor’s financial capacity and desire is a critical component of the advice that financial advisors need to provide. We saw in the financial crisis of 2008 many of these financial sponsor-backed bids fell through, the consequences of misreading this market (guessing based upon prior deals instead of being in the leveraged finance market trading securities every day and knowing what is possible) can be devastating. Although not typically a buyer of companies, activist shareholders are another player now impacting M&A transactions. Activist investing is not only the domain of a core group of hedge funds anymore, even institutional investors are becoming increasingly engaged. Of the campaigns announced in the last 12 months alone, ~86 separate investors have targeted more than 160 companies. Of these campaigns, 69 have led to activist additions to the board of directors, 21 have led to proxy fights and 10 have resulted in sales of the target company. Many examples exist in technology of activists having direct involvement in situations which ultimately end in a sale of the company including my board, Polycom’s, recently announced merger with Mitel which later evolved into a sale of Polycom to Siris Capital. Having a financial advisor who has an experienced activism defense team is important in preparing the board early in building and articulating the company’s long-term plan for value creation and helping the management and board understand their strategic landscape and M&A scenarios. This entry was tagged ‘Something, &mdash, Around, before, booms, Different, seen, Tech, This, Time, We&rsquove. Bookmark the permalink.